Source: Hope, L. L. (1914). The Moving Picture Girls Under the Palms or Lost in the Wilds of Florida.New York: Grosset & Dunlap. The film troupe departs New York for Florida. A member of the cast finds himself in serious need of assistance. The reader is introduced to the previous adventures of the DeVere girls. Mr. Towne is helped by the DeVere girls. Mr. Towne protests the filming of the accident. A newspaper article catches Alice’s eye. Alice and Ruth ponder the identities of the two missing girls. An incident on the ship has the passengers preparing to load the lifeboats. The evacuation is halted, but the Captain’s assessment of the ship is not good. Contact is made with a second ship as the situation continues to decline. The passengers of The Tarsus load into the life boats as the fire continues to rage. Help finally arrives. The DeVere sisters, Russ, and Paul take a look around. The troupe finds refreshment in the Fountain of Youth. Alice is startled as the explores city alone. Jake's story is told to Alice. Alice and Ruth take part in a motor race. The race concludes with a big splash. News of the next destination worries the Ruth and Alice. The actors meet some of the local residents. Alice and Ruth are discouraged from exploring. Alice and Ruth get more information about the missing girls. Shooting commences on The Magnolia. Mr. Dunn finds himself in real danger as the movie continues filming. After a struggle, Mr. Dunn is finally rescued. The troupe encounters a strange animal while traveling downstream. After a brief tangle with a manatee, the boat frees itself. A hunter arrives just in time. 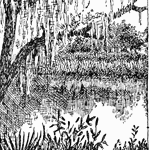 The troupe finally encounters alligators. Mr. Pertell films his first alligator hunt. The hunter cautions the troupe from going any deeper into the swamp. The troupe continues filming, but soon find they have strayed off-course. The troupe assesses the situation and prepares for much need rest. A distant cry startles Alice and Ruth. Night passes slowly into day as the troupe wait safely offshore until sunrise. The troupe re-boards the craft in search of The Magnolia. A turn down the creek leads to a discovery. The group approaches the hut, hoping it's occupants will be able guide them out of the swamp. Alice and Ruth are surprised by the arrival of two acquaintances. The missing girls and the film troupe share the stories of their adventures. The group is reunited with The Magnolia. Hope, Laura Lee. The Moving Picture Girls Under the Palms or Lost in the Wilds of Florida. Lit2Go Edition. 1914. Web. <https://etc.usf.edu/lit2go/44/the-moving-picture-girls-under-the-palms-or-lost-in-the-wilds-of-florida/>. April 25, 2019. Laura Lee Hope, The Moving Picture Girls Under the Palms or Lost in the Wilds of Florida, Li2Go edition, (1914), accessed April 25, 2019, https://etc.usf.edu/lit2go/44/the-moving-picture-girls-under-the-palms-or-lost-in-the-wilds-of-florida/.